The HF-A21 module is a compact high performance WiFi module providing 802.11b/g/n 2.4 GHz WiFi networking for a printed circuit board device design. With a rich feature set and an industrial temperature range, this surface mount embedded module is well suited for many applications even in harsh environments. 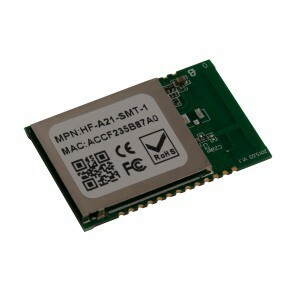 A small footprint makes the HF-A21 easy to use in handheld devices. Available with 2 antenna options, the HF-A21 module provides design flexibility to meet specific application requirements or can be used in existing device designs. The interface with the HF-A21 is via 10/100 Ethernet and high speed UART. Using either the user-friendly web page or an AT+ instruction set, this module is easy to configure. The HF-A21 can operate in Infrastructure Station (STA) mode, Soft Access Point (AP) mode or AP+STA mode. Support for Ethernet-to-WiFi Router/Bridge mode networking is also provided. The knowledgeable and experienced engineers at Grid Connect provide complete technical support for the HF-A11 and the High Flying line of embedded WiFi modules. We offer phone support and on-line chat support during regular business hours.